RICHLAND, Wash. – Many seashells, minerals, and semiconductor nanomaterials are made up of smaller crystals, which are assembled together like the pieces of a puzzle. Now, researchers have measured the forces that cause the crystals to assemble, revealing an orchestra of competing factors that researchers might be able to control. The work has a variety of implications in both discovery and applied science. In addition to providing insights into the formation of minerals and semiconductor nanomaterials, it might also help scientists understand soil as it expands and contracts through wetting and drying cycles. In the applied realm, researchers might use the principles to develop new materials with unique properties for energy needs. The results, published in the Proceedings of the National Academy of Sciences in July, describe how the arrangement of the atoms in the crystals creates forces that pull them together and align them for docking. The study reveals how the attraction becomes stronger or weaker as water is heated or salt is added, both of which are common processes in the natural world. The multinational team, led by chemists Dongsheng Li and Jaehun Chun from the Department of Energy's Pacific Northwest National Laboratory, explored the attractive forces between two crystal particles made from mica. 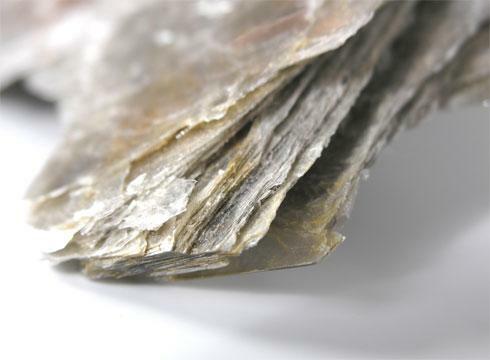 A flaky mineral that is commonly used in electrical insulation, this silicon-based mineral is well-studied and easy to work with because it chips off in flat pieces with nearly-perfect crystal surfaces. Crystallization often occurs through assembly of multi-faceted building blocks: some faces on these smaller crystals line up better with others, like Lego blocks do. Li and Chun have been studying a specific crystallization process called oriented attachment. Among other distinguishing characteristics, oriented attachment occurs when smaller subunits of fledgling crystals align their best matching faces before clicking together. The process creates various nonlinear forms: nanowires with branches, lattices that look like complicated honeycombs, and tetrapods — tiny structures that look like four-armed toy jacks. The molecular forces that contribute to this self-assembly are not well understood. Molecular forces that come into play can attract or repel the tiny crystal building blocks to or from each other. These include a variety of textbook forces such as van der Waals, hydrogen bonding, and electrostatic, among others. To explore the forces, Li, Chun and colleagues milled flat faces on tiny slabs of mica and put them on a device that measures the attraction between two pieces. Then they measured the attraction while twisting the faces relative to each other. The experiment allowed the mica to be bathed in a liquid that includes different salts, letting them test real-world scenarios. The difference in this work was the liquid setup. Similar experiments by other researchers have been done dry under vacuum; in this work, the liquid created conditions that better simulate how real crystals form in nature and in large industrial methods. The team performed some of these experiments at EMSL, the Environmental Molecular Sciences Laboratory, a DOE Office of Science User Facility at PNNL. One of the first things the team found was that the attraction between two pieces of mica rose and fell as the faces twisted relative to each other, like when trying to make a sandwich out of two flat refrigerator magnets (go on, try it). In fact, the attraction rose and fell every 60 degrees, corresponding with the internal architecture of the mineral, which is almost hexagonal like a honeycomb cell. Although other researchers more than a decade ago had predicted this cyclical attraction would happen, this is the first time scientists had measured the forces. Knowing the strength of the forces is key to manipulating crystallization in a research or industrial setting. But other things were abuzz in the mica face-off as well. Between the two surfaces, the liquid environment housed electrically charged ions from salts, normal elements found during crystallization in nature. The water and the ions formed a somewhat stable layer between the surfaces that partly kept them separated. And as they moved toward each other, the two mica surfaces paused there, balanced between molecular attraction and repulsion by water and ions. The team also found they could manipulate the strength of that attraction by changing the type of ions, their concentration, and the temperature. Different types of ions and their concentrations changed electrostatic repulsion between the mica surfaces. The size of the ions and how many charges they carried also created more or less space within the meddling layer. Lastly, higher temperatures increased the strength of the attraction, contrary to how temperature behaves in simpler, less complex scenarios. The researchers built a model of the competing forces that included van der Waals, electrostatic, and hydration forces. In the future, the researchers say, the principles gleaned from this study can be applied to other materials, which would be calculated for the material of interest. For example, manipulating the attraction might allow researchers to custom-build crystals of desired sizes and shapes and with unique properties. Overall, the work provides insights into crystal growth through nanoparticle assembly in synthetic, biological, and geochemical environments. This work was supported by DOE's Office of Science, the National Science Foundation, PNNL and China's Xi'an Jiaotong University. Reference: Dongsheng Li, Jaehun Chun, Dongdong Xiao, Weijiang Zhou, Huacheng Cai, Lei Zhang, Kevin M. Rosso, Christopher J. Mundy, Gregory K. Schenter, James J. De Yoreo. Trends in mica-mica adhesion reflect the influence of molecular details on long-range dispersion forces underlying aggregation and coalignment, Proc Natl Acad Sci U S A Early Edition July 18, 2017, doi: 10.1073/pnas.1621186114.